A crazy-quilt of a modern noir set in a remote island with eccentricity to spare. 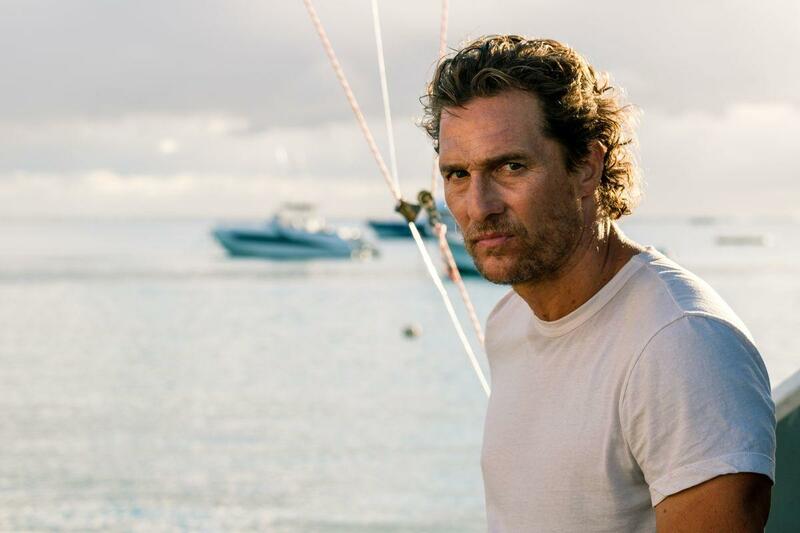 Serenity is anything but that considering Matthew McConaughey plays dissolute boat captain Baker Dill. While the loose tuna and shark fisherman with a questionable past is caught in a noir tangle with his ex-wife, Karen (Anne Hathaway), other nightmarish activities make this the most challenging thriller of this season and a head scratcher right to the end. In an unknown seaside island in some ocean, Dill pursues a large tuna regularly, in Ahab fashion. Meanwhile he also takes out fat cats like Karen’s abusive husband, Frank (Jason Clarke), whom she is going to pay Dill dearly to let him sink into the sea sodden and surly. The plot convolutes as the background of the motivations veers wildly, including Dill’s son, Patrick (Rafael Sayegh), who becomes more of an influence over the action as the story progressives. As in most film noir, not all pasts are forgotten and not much is as it seems. The sun and sea are hypnotic, the characters nutty, and th plot overwrought. Nevertheless, you could do much worse in this down-time for new releases. I liked it enough to stay through the credits, where I discovered the movie was filmed in Mauritius. I’m going there!